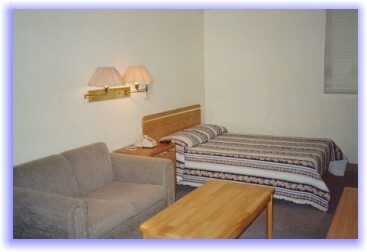 Each of our 55 air-conditioned guest rooms are fully furnished with standard furniture and fixtures. All rooms are also furnished with a refrigerator, remote controlled cable TV, and full bath and shower. Our Double Rooms are very spacious and feature two Full Size beds, living room set with sofas and coffee tables. These are the best rooms you'll find at this price range! Our Singles are furnished with a comfortable Full Size bed, and also have a sofa for relaxing in. 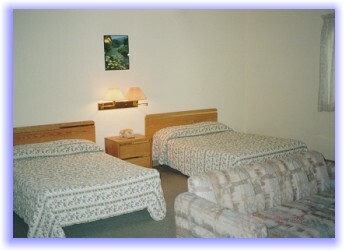 Our Family Rooms are very spacious and are furnished with two Full Size beds and a Twin size bed. We also have rooms with kitchenette for those who prefer their own cooking! 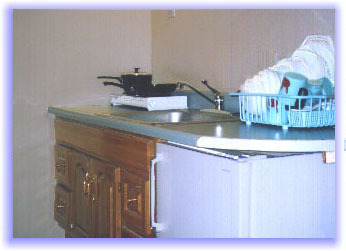 Kitchenette Rooms are also furnished with microwave ovens for quick heating and light meals! Please contact us for our most updated Room Rates!